As usually, I’m long overdue to do a round up, but I have been working on it for a while. This past week, I decided to go into town for our 3rd Thursday event. They close off our downtown have lots of street vendors and live performers. Some are really great, and some are well, not so great and being cheered on by their mom and dad. The paper said we had over 10,000 visitors to this week’s event which was very surprising because it was in the 90’s and very humid. 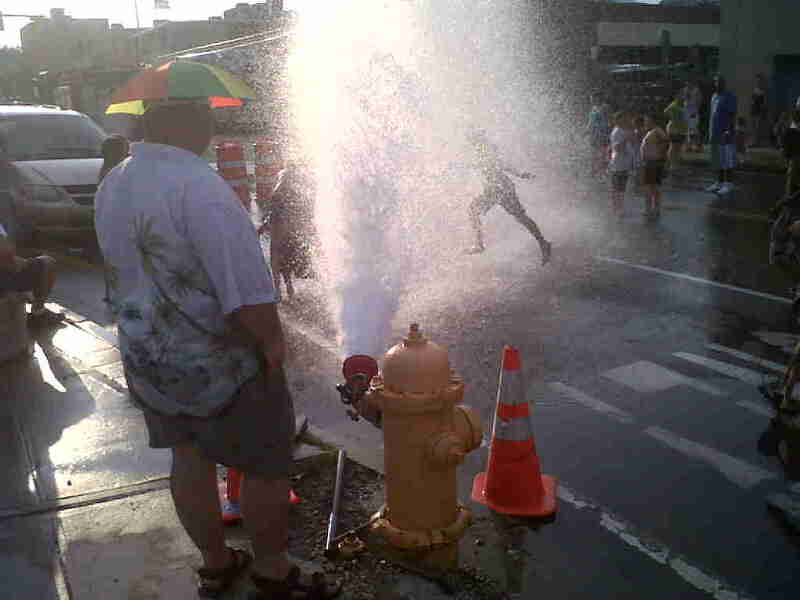 The highlight by far was when the fire station opened a hydrant for people to cool off in. We spend the majority of our time there. I love simple summer fun and it’s so cool that our town is doing all this great stuff. When we moved here 15 years ago, the downtown was a total dump. Now there are internet cafe’s and sushi bars. Art and Culture really does revitalize communities. I know my employer has like 1/4 of the employees it had 15 years ago, so I can’t give the local industry much of the credit. Hurray for the arts and NYC tourists. Technically, I don’t even need to do a roundup when Broke Professionals pulled together the most amazing and awesome group of links ever. It’s called 1000 Ideas to Save Money and it features all kinds of articles from the Yakezie Network . It’s super well organized and it’s broken down by category. What more could you want? Speaking of Awesome Ideas, see this roundup on “If I had a Million Dollars” that Invest it Wisely pulled together. About 1/2 dozen bloggers all wrote articles about what they’d do if they came upon $1MM from some long lost relative. It was very interesting reading about everyone’s financial plans. Most of the bloggers made sure to set up some kind of passive income stream with the plan. Go over and check it out. 101 Centavos also featured photos of his favorite blogger’s gardens. I really think seeing people’s gardens really tells you a lot about their personality. I also loved Invest it’s Savings = Freedom post. He compares two families with different savings strategies and how it works out for them. Canadian Finance Blog has a good intro article on The Basics On Bonds. Mom Vesting also has an article on bonds as well with Simple Does It: Bond Bubble. I have been really slacking in the area of managing my retirement and I need to brush up on some of this stuff, so thanks CFB and MomVesting. Monevator has a great article on how to live on investment income. Since this is what I’d like to do someday in the future, it was interesting reading his take on the whole thing. While The Dividend Guy Blog shows you How To Build a 6 Figure Income Dividend Portfolio with $600 per month. Pre-Paying Your Mortgage – Obsessive or Responsible? is the question asked by Darwin’s Money. I am drawn to these posts like a bee to honey. Of course, I’m always up for throwing extra at the mortgage if you’ve got extra dough. A little bit every month does add up. Time flies and before you know it you’ve been in your house 10 years. Everyone has a story that inspires them and hear what Crystal from Budgeting in the Fun Stuff has to say about not wanting to qualify for meals on wheels during retirement. My aunt and uncle got those for a while…and they are barely eatable. It was great they got them as I doubt they’d be fed otherwise but let’s hope we don’t have to rely on charity in our golden years. Retire by 40 asks When Can We STOP Saving Money? Good Question. Definitely a gray area, but it’s good hearing about Rb40’s perspective and especially how it will change now that baby RB40 is in the picture. Certainly our savings goals and spending budget expanded a lot as our family grew. Are Metals Signaling That Inflation Is Coming? Buy Like Buffet asks an important question. I work in an industry that buys a lot of key raws and they are going through the roof as well. I’d say yes, inflation is coming, like it or not. Hopefully that’ll mean interest rates for savings will go up some too. That would be a welcome upside to inflation. Popular Ways to Cut Spending to Save More Money One Money Design has a checklist that’s worth doing a once over if you’re looking for low hanging fruit type ideas. Len Penzo has 50 personal finance habits that everyone should follow. Go check it out and see how many you do. Have you heard of Library Thing? It’s apparently an online utopia for bibliophiles. Nicole and Maggie think it’s the best thing since sliced bread…and no they weren’t paid to say that. 101 Centavos has a great story and travel safety tips. I had a lot to say about this topic as I’ve traveled my whole career and I’ve seen and heard about a lot of incidents over the years. If you’re planning a trip, head on over there and read the article and the comments. It’s packed with great tips. Everyday Tips has a great uplifting story about Dan and his Starbucks runs at the cancer center. One person can make a difference for sure. It reminds me of my friend Kenny who died 1.5 years ago. He used to be a nurse and when the hospital stopped paying for serving fresh baked cookies in the break room for visitors and patients, Ken started buying them with his own money and bringing them in every day. 2011 Mid-Year Review: Online Endeavors And Building A Community. Financial Samurai is doing amazing things with building his online community dedicated to giving back. I constantly feel fortunate to be a small part of this community. For my green friends,Money Green Life tells us how to Adopt A Greener Approach This Summer or if you want to go all the way, you can even look for a career in this sector as it’s booming right now. Check out Green Collar Jobs Outperform by Financially Consumed. Giving My Husband a Financial Handicap Guest Post by Amanda at Frugal Confessions on Budgeting in the Fun Stuff. Amanda discusses how she and her husband come together in the area of finances. They say that more than 1/2 of marriages end because of financial issues, but I really think part of the root of it is that couples can’t or don’t want to compromise and come together on a solution they both can live with. Money Reasons talks about Backstabbing Friends and if they’re worth it. The answer is no. If you’re happy with yourself, you don’t need loser friends to make you feel like you are somebody. Squirreler has a great squirrel story that relates collecting acorns to relocation. Very fun article and it has a good point in the end. Sandy from My Tenant From Hell is finally starting to share her saga in a 4 part series. She just posted part 1. If you’re on the fence about being a landlord, make sure you read her horror story. Sustainable Personal Finance shares and continues a tradition his dad started. Cleaning up a Campsite after use. I’m not just talking your trash but also trash that maybe previous campers left behind. What a great tradition for people who love the outdoors…especially pristine clean outdoors. It’s good that we can do our part. My own version of this, is I often go around picking up trash in the playgrounds when the kids are playing. There’s usually a trash bin nearby and it gives me something productive to do while they are entertaining themselves. Well Heeled Blog is Dreaming of Moving to Lower Cost of Living. She lives in California right now and loves the Carolinas. I lived there from Sept-May and the weather was just so awesome. Plus, you’re driving distance to the city, beach and mountains. That’s my criteria for any place I live. North Carolina is definitely on my short list of places I’d live and Ashville is a climber’s dream. Dr. Dean talks about Diabetes, Money, and YOU! I have a good friend with Diabetes, so this is a great article for her. How To Plan For Massive Debt @ PF By The Book. Debt Free by 30 is excited about her batch cooking progress. I’m personally emptying my freezer in preparation for the upcoming garden bounty. I’ve been out of eggplant parm for months and can’t wait to stock back up again. Little House has a great article on inflation over the last 40 years. Wow $0.40/gallon for gas. Last but not Least Happy BLog-birthday to Bucksome Boomer. She’s giving away over $400 of stuff as part of her birthday bash. Thanks for the double mention! And what a whopper of a roundus… I like that you take the time, to offer commentary and description by the links/titles. It simplifies whether to click through or not. 101- That’s why my roundups are few and far between. I can’t just link without my editorial commentary and I end up having a draft for weeks before I finally send it. Don’t you just love summer??? Great roundup! Have a great week!!! Nicole – oops..nice catch. I fixed the original link. I am so excited for tomatoes. We have little green ones, finally. The wait has been horrible. I love those 3rd Thursday events in our old town!! It’s so fun to walk around and see what’s going on!!! Great links, I’ve got my reading now! Wow that’s a lotta links! Yay for more stuff to read. The double inclusion actually! I’m finally catching up with all of the roundups.